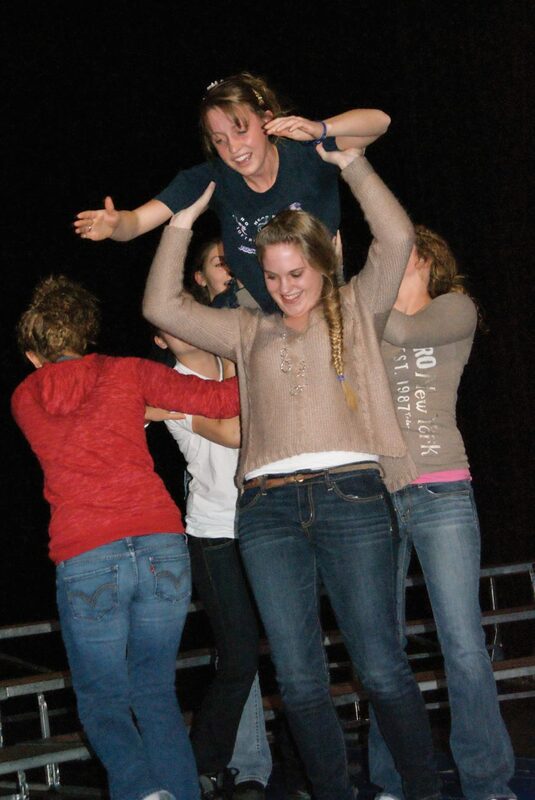 Moffat County High School sophomore Laurel Tegtman, center, helps hold up senior Eryn Leonard, top, during the MCHS talent show rehearsals. Both members of the MCHS girls swim team, the team is performing a synchronized swimming act out of water for the show. The atmosphere of the Moffat County High School auditorium Thursday afternoon was one of support, encouragement and hilarity. Students rehearsed for the first MCHS talent show, slated for 6 p.m. Wednesday. With around 14 acts signed up, Evan Gaffney, teacher advisor to the student council committee and in charge of the talent show, said he hoped the show would be as big and as good as possible. Gaffney told students not to be nervous rehearsing as they weren’t auditioning. Those signed up were in the show. “You’re in. I’m just here to make sure it’s not an absolute terrible spectacle,” Gaffney jokingly addressed the students. Gaffney said he wanted the show to be after school rather than during because he wanted those who attended to want to be there. “The people who show up will be there for you, to see and support you. The fact that you showed up and they showed up is enough,” Gaffney said. The students participating ranged from nervous to take the stage to requesting spotlights only. But those who were nervous or a little shy were met with encouragement from fellow students, who gave positive feedback and told them to relax on stage. The girls swim team kicked off the rehearsal with a synchronized swim routine, except not in water, which left the students watching cracking up. Freshman Paige Durbin followed singing and playing the guitar. Durbin said she was participating to gain more confidence singing and playing by herself. “It can be scary, I have a little stage fright,” Durbin said. Durbin began playing the guitar a little over a year ago and said her favorite part about playing is all the different techniques she can do with chords. Most of the acts involved students singing or playing a guitar, but there was a 70s brass band group that played an original piece, Hashtag Yolo. Freshman Gingrich was involved in two acts, a duet performing a song by Evanescence and a solo performance of the Beatles song, Something. “I get a little nervous,” Gingrich said. But being an underclassman doesn’t get her nerves going. Gingrich said she absolutely adores singing, and chose a song by the Beatles because, “it’s the Beatles,” Gingrich said emphatically. Gaffney said he hopes the show will see a big audience and that the community will come as it’s free to attend.